I always try to write about how I get inspired and about the intimate dialogue established between the crafter and the materials. A couple of days ago I came across this paper on Crafts and Technology by Dr. Katie Bunnell, Reader in Design Research, Falmouth College of Art, UK, where she presents an interesting definition of craft supported by the psychological notion of flow (the reason why knitting or any other craft activity is so relaxing and fulfilling). "For this paper I would like to define craft as an essentially human and humanising process. To craft something involves human interaction with technology whether it’s a pen, hammer, or computer software and hardware. In the experience of a maker it involves a high level of autonomous control over a holistic process of designing through making. Crafting something, involves what Mihály Csíkszentmihályi calls ‘flow’ activity, an activity that engages an individual to the extent that they lose track of time and have a strong sense of fulfilment and achievement through this process of engagement. Csíkszentmihályi claims that it is ‘flow’ that enables people to be happy, fulfilled and successful in their lives, as opposed to material gain or even ‘intelligence’. Craft is then both process and product. And as professional makers both processes and their products are embedded in a continuous internal dialogue between maker and technology while being both consciously and subconsciously influenced by the external forces of the cultures of craft, design and beyond. Craft also exists as flow activity on a human level in the generation of objects and social systems that are understood to be beyond the realms of professional craft practice and belong in the territory of ‘amateurism’ or folk art." If you are interested in reading this paper I found on the World Crafts Council International website (which to my pleasure I discovered its international President is a former college teacher of mine), you can download it here. I think we are all trying to understand the current craft movement and how it will evolve. I'm particularly interested in people developing their creative side and see how many of them are making a living out of their crafts. Isn't like a dream come true to be your own boss and to have a job that ensures being in that flow mood for a good part of your working day? Is it possible to lose that joyful feeling of crafting if you turn it into your official job? I can't believe it's been almost two years since I started making these felt balls. I've never decided what to do with them. A necklace, a pillow sham, a bag. For now, they will stay in that box. very interesting... originally, it was the pic. 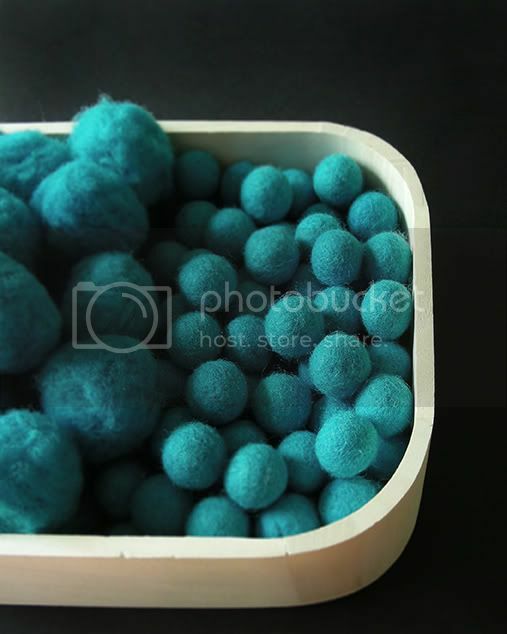 of the felt balls that attracted me...but these are really great thoughts. I tend to think of craft as a hybrid between design and art...there's a love there, but also a type of perfectionism or pursuit that is an expression of that love. i do think it's possible to have 'craft' even in fine art.